Made in the USA, by Professional Craftsmen, with World Class Workmanship. When you consider, all of the wonderful ways to bring a room to life - Is it any wonder designers have such a soft spot for pillows? At The Quilting House, our exquisite line of C.O.M. 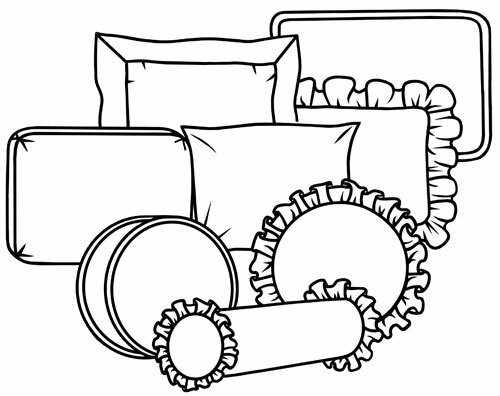 pillows includes an exceptional collection of Throw Pillows, Neck rolls, Ball pillows, and practically anything else that catches people's fancy. Nobody puts more into their pillows than we do! Whether you want it simple or sumptuous, the accent is on diversity of style and design. Banding (plain or shirred) is also an option that can be sewn on the base. The fronts can be quilted, to the pattern of your choice. To insure the highest quality and satisfaction, we can provide all sizes of custom sized blown inserts with your choice of - poly, down, synthetic down, or our own unique poly-down blend. Width and height dimensions are from seam to seam, not including flange, ruffle, welt, etc. You can provide your own inserts, we would like to have them to custom fit the covers. You can design your own pillow, and we will provide you with a quote for the yardage and cost to fabricate. When we cut fabric, we don't cut corners. All pieces are painstakingly pattern matched. No pillows are made to more exacting specifications. To eliminate the sagging that commonly occurs from corner to corner on square-cut pillows, we cut our pillow bodies on a slight crown. So our finished pillows feature a clean, straight line along all four edges for a more aesthetically appealing look. Each size insert contains a standardized amount of precisely measured fill to ensure consistency from one piece to the next. Even our standard fill is a special blend of highly resilient polyester fiber, selected for its optimal shape retention and softness.